Birmingham meet-up, Saturday 15 June! I've got exciting news today friends! Claire (SEW, Incidentally...), Kat (Krafty Kat) and I are organising another Birmingham meet-up this summer and we thought we'd give you plenty of notice in case you fancy joining us from far and wide. HOME TIME: 4:00pm – 4:30pm, but we won't hold you hostage if you want to leave earlier! Kat and I organised a similar affair last year and it really was a blast! Check out my round-up post if you don't believe me! All these smiley faces can't be wrong...can they? Much like last time, first we'll visit the rag market stalls for some bargains - Roisin made a beautiful Matroyshka print dress and Winnie made an adorable polka dot blouse, both with fabric scored last year! Then we'll re-charge over a leisurely lunch (possibly at Cafe Soya again as the food is yummy and the venue accommodating), whilst indulging in a bit of a swap. The swap part is very informal and there are no obligations to contribute. However, if you do want to de-stash then bring your unwanted fabric, notions, patterns, books, etc along and they'll get snapped up in a jiffy! Finally, there'll be time in the afternoon to re-visit the market or experience the awesome local fabric shops (or should I say an Aladdin cave and warehouse?) – Fancy Silk Store and Barry's Fabrics. Have I convinced you to come along yet? If so, just leave a comment below with your email address...it's that easy! Once we have a final list of names, we'll send out a confirmation email with maps and contact numbers to boot. For now, you can download a Birmingham Shopping Map PDF, which also locates the Rag Market and Birmingham New Street train station. We're looking forward to seeing you there! 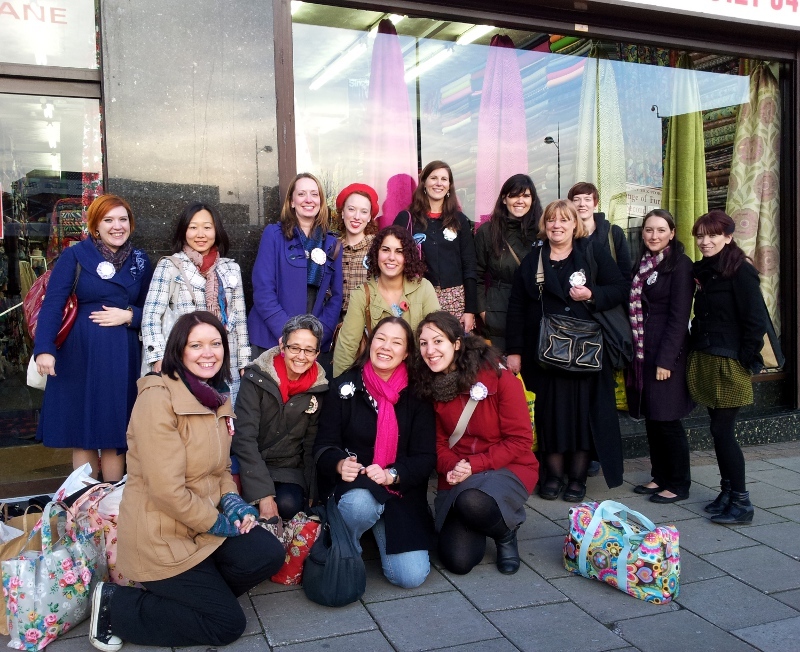 If you can't make it though, Claire is also organising Brighton and London meet-ups too! I'm in! Kat mentioned it the other week so definitely up for it. Ooh, yes, I'd love to join you all there. When my gentleman used to live in Birmingham we would always go to Cafe Soya for weekend lunches, but I didn't sew then, so I never made the most of the amazing fabric shops and the Rag Market. It's rose.pearce at gmail. Oh no! Well, let me know if you decide to change your flights! I would so love to do this, but the next day I'm doing the London To Brighton bike ride and I think I need to be realistic about how many big events I can fit into a two-day weekend. Have fun without me - SOB! I'm gutted that I can't be there, it's just a month too soon! I shall be at the london meet with bells on and looking forward to meeting you though. Oh yes, count me in! Really enjoyed the last one. Brilliant, so glad to hear it Catherine! Drat! I'ma actually already busy then- going to a wedding. I was so hoping to come as well. Fingers crossed for next time. I know Kerry...I thought of you the minute we picked a date because I remember you showed an interest last year! Such a shame you can't come, although you have bigger and better priorities now ;o) Rest assured that we will be organising more down the line, so I'm sure you'll get to one soon! Im want to come to Birmingham as my first sewers/sewists meetup. is it only for bloggers cos i dont have a blog? I would love to come! Can't wait. Yay, that's great news and it's really cool that your daughter wants to come along too! Fab - train tickets are booked! We're looking forward to it. Ack...I can't make it to Birmingham OR Brighton. Boo...it was lovely meeting you guys in London. I may be able to make it to the London date...I'll know nearer the time. Fingers crossed. And have a great time. I'm a bit of a newbie but I'd love to come along and the trains are looking pretty reasonable at the moment! I haven't been to the Rag Market since I went with Minnado and Scruffy more than a year ago! any thoughts on whether babies are welcome? my son is 6 months... if not I can definitely come to the next one without him! Oooh, yeah! Do come along! I can't imagine anyone objecting to a cute baby ;o) Best to get him into fabric shopping and sewing as early as possible! Hehe! Let me know if you'd like me to add you (and baby boy) to the list! I'll be coming along with a friend, looking forward to it! I will ask my friend to pass on the details as I don't like putting my email address on websites and such. But looking forward to the day itself! it looks like a lot of fun! If it's not too late, may I add my name to the list? Great news:) My email is erixmitchell@hotmail.com. Look forward to hearing from you!